It’s clear to see why the Bridge was named one of the “Seven Engineering Wonders of the Modern World” by the American Society of Civil Engineers. People come from all over the globe to learn how it was built, to admire its magnificent Art Deco design, and to be inspired. 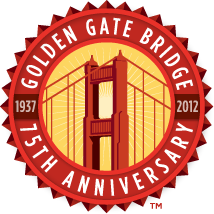 If you plan to visit, look for tips, directions and parking, transit, and weather information on the Golden Gate Bridge's website. If you can’t visit in person, take the virtual Bridge walk and check out the view from the top of the south tower. Hear fascinating stories of danger, challenge, and ingenuity about building the Bridge on personally guided 45- and 60-minute tours. Day and evening tours offered, spring through fall. You can also make a “virtual visit” to off-limits areas—with the photo to prove it!—at the Bridge Photo Experience, open year-round. Visit the striking new Bridge Pavilion where you’ll find historic artifacts, exhibits, and an array of newly created unique products celebrating the Golden Gate Bridge. Discover the science and engineering behind the Bridge’s construction through hands-on exhibits just outside the Pavilion. The Bridge Pavilion is open 9 am to 6 pm. Savor a casual, healthy snack at the Bridge Café, featuring delicious local foods and beverages highlighting California’s renowned culinary bounty. The Bridge Café is open 9 am to 6 pm. Both ends of the Bridge touch the Golden Gate National Parks. Enjoy picturesque trails and vista points in one of the world’s largest national parks in an urban area. Visit www.parksconservancy.org to begin your adventure.